Nice Mod. Fast delivery to Germany. Good quality and well packaged. I recommend buybest! Excellent mod, great price and fast, excellent service from Buybest! Buybest has earned a lifetime customer! 1. It's very nice to do it and not to make up some kind of iridescent material. 2. Its button has a strong good pressure point and is stable in its erection, so it will not be a problem. 3. The screen is something wonderful. We can get a lot of information about it and there are no problems with its brightness. 4. 510 steel joints and good springs. 5. The battery door very good(magnet) and nice 6. Switch to the electronics. Compared to its price, it's comparable to the more expensive MODs, because it handles the battery well and smoothes it evenly. I have not tried TC mode so I can not open it. 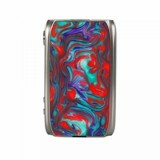 IJOY Shogun Univ 180W TC Mod Dual battery 18650 (not included) Screen: 0.96 inch Material: zinc alloy / resin Weight: 0.2000 kg Size: 3.46 x 2.17 x 1.12 inches This is a very nice mod. Beautiful double-sided resin panels. This is the second one I bought for my husband. This is a very nice mod. I like a lot the resin panels and the fact that it has both panels with resin. 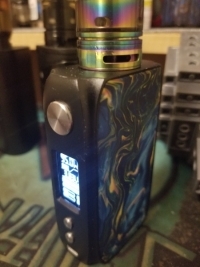 The Mod feels very nice in hand. 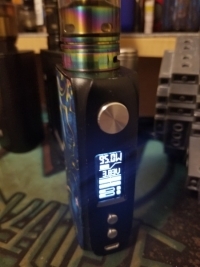 I like it a lot and the buttons look good on the mod and they are very clicky.It is a very well made and solid mod. The menu is ok and is very simple to use. The materials used are of good quality. Thank you Buy Best! The Shogun Univ MOD only needs dual 18650 batteries for max 180W output. Different from other box mod, the Shogun Univ has optional POWER, POD, PMODE, and TEMP mode, which is quite amazing for an e-cig mod. Let along its built-in UNIV chipset which is designed for safe, stable and intelligent performance. Except for the function, its beautiful double-sided resin panels for a high-end appearance will definitely catch your attention. We recommend you to use it with the Katana Tank. • Shogun Univ Kit and Katana Tank are also available in BuyBest. 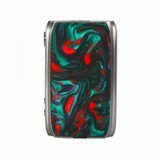 Dual-battery mods are extremely popular among cloud chasers all over the world. They are usually powered by dual 18650, 20700 or 21700 batteries so they can provide vapers with sufficient power for them to chuck clouds on sub-ohm tanks and rebuildable atomizers like RDAs, RTAs and RDTAs. 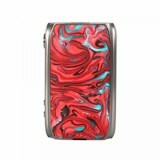 Compared with single-battery mods that usually have a maximum output power around 100 watts, dual-battery box mods are usually more powerful and safer at high watts, enjoy a relative longer battery life and provides vapers with more options to choose from. In today's article, we will focus on a typical dual-battery mod the Shogun Univ TC Mod from the well-known vape manufacturer the iJOY. 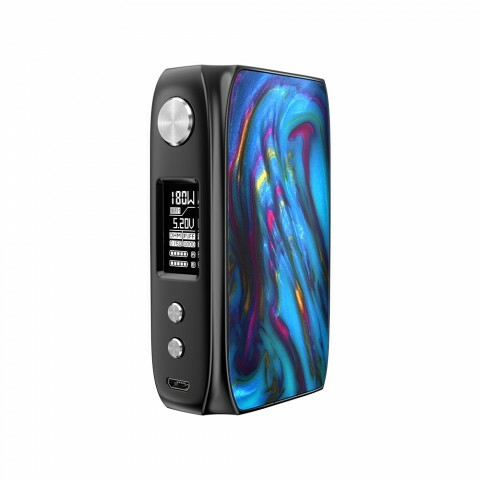 As one of the latest releases from iJoy, the Shogun Univ TC Mod is a smart looking, sleek feeling, dual-18650 box mod with a maximum output of 180W, which is powerful enough for most vapers, even if they are running an RDA with a crazy build. 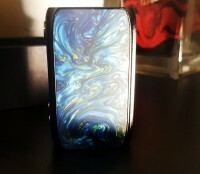 With the box mod (no cell) you get a USB Cable and a User Manual. Powered by an advanced UNIV chipset for safe, stable and intelligent performance, this vape mod supports tons of modes, such as POWER, POD, PMODE, and TEMP modes. 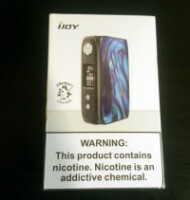 Which is definitely a huge improvement over previous iJoy products. 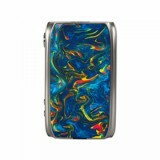 The mod is manufactured with great quality, nice curves and a very comfortable hold in your hand. The cold metal against the resin is a lovely combination with a nice weight to it. 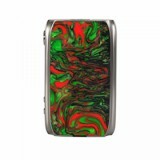 The detachable battery door fits snugly to the body of the mod with little movement. 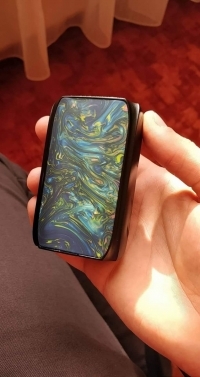 It is quite easy to open the battery door of this Box Mod. Simply lift the door from the bottom of the device and off it comes. It is fixed by two strong magnets at the top and bottom. After lifting the door away, you will find the battery bay which houses two 18650 cells. The vape mod comes with a bright 0.96 inch OLED display under the fire button, which displays all the essential information you need. In addition, the Shogun Univ TC Mod also comes with a multitude of protections and alerts such as Short Circuit Protection, PCB Temperature Overheat Protection, Low/High Resistance Protection, Battery Reverse Protection, Switch Timeout Protection and Low Power Alert. 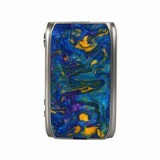 This is a well-made nice-looking vape mod with great performance and an affordable price. Very responsive and has a very easy-to-navigate menu system that allows you to set up your device to satisfy your own personal vaping needs. 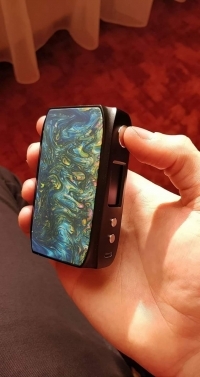 Therefore, if you are looking for a beautiful and affordable vape mod that fits very well in the hand, we highly recommend the iJoy Shogun UNIV TC MOD.